Oh, Lego technology, how far you’ve come. Previous (and, recent, mind you!) 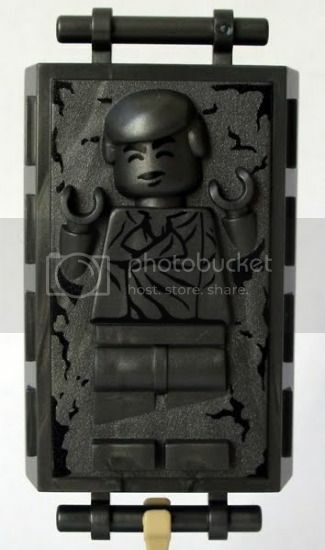 versions of the Lego Han Solo in carbonite piece were rudimentary at best, and ugly at worst. But this most recent incarnation–available as an accessory included with the LEGO Star Wars Slave 1 set–is a frigging work of art. And apparently I’m not the only one who things so, since the piece is being sold as a standalone item on Amazon for $25. WHAT???? are you kidding me? for 25$ dollars I could make you a better one than that! !